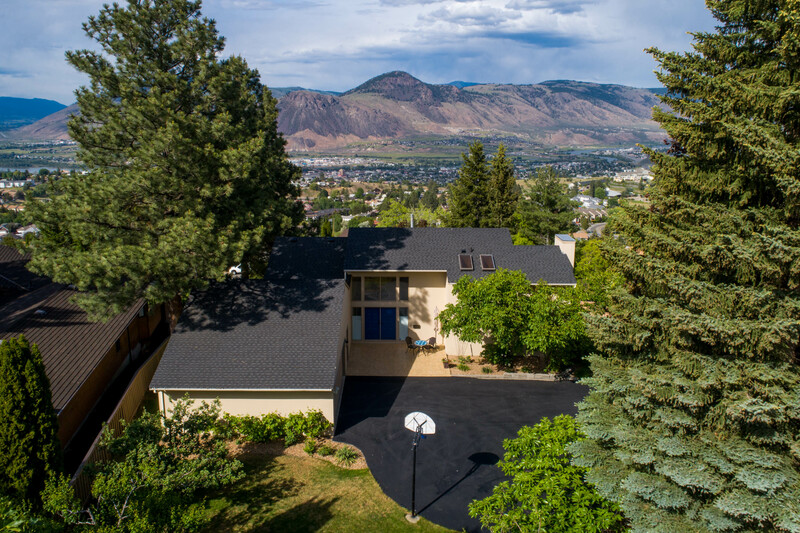 New Listing: 412 Monarch Court, Sahali, Kamloops, BC $749,900. Gorgeous, meticulous Karl Willms designed Sahali home located on a super private 17,395 square foot lot. This two storey style home has sprawling river and valley views from nearly every room of the home. The main entry has high ceilings and is open to the second level. The living and dining rooms are open with the living room a couple steps down giving the ceiling level more height. The kitchen is open to the family room and eat in nook area. There is access to the large deck with access to the yard space. The top level features 4 large bedrooms with a fully updated 4 piece main bathroom and renovated 3 piece ensuite. The basement level is unfinished and is ready for your ideas. There’s a separate entry to the basement and potential for an in-law suite. This home has had a number of updates including roof, furnace, hot water tank, central a/c, painted inside and out, updated stone countertops, flooring, appliances. This property features a fenced yard with irrigation throughout the entire property. There are a number of fruit trees and beautiful perennial gardens. There is lots of parking and includes a large two-car garage (26×26) and room to have an RV.